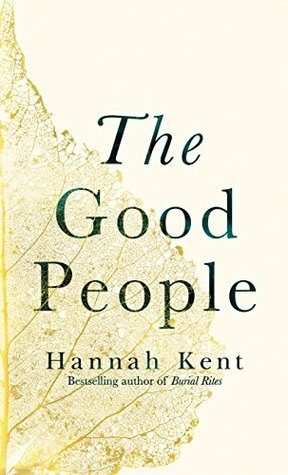 The Good People is the second novel from Australian author Hannah Kent, following her 2013 debut Burial Rites. I liked Burial Rites – the story of a woman found guilty of murder in 19th century Iceland – but I didn’t love it the way so many other readers did and I was curious to see what I would think of this new one. Now that I’ve read it, I can say that this is definitely my favourite of the two. The Good People is set in rural Ireland in the 1820s. Nóra Leahy is going through a difficult time, having lost both her daughter and her husband in the space of a year. She has been left to take care of her four-year-old grandson, Micheál, who should be a blessing to her – but to Nóra he is nothing but a worry. She remembers seeing him as a healthy, happy baby, yet the little boy her son-in-law has brought to live with her is entirely different: he is thin and sickly, has lost the use of his legs, can’t understand what is being said to him and communicates through uncontrollable screaming. Nóra knows something is badly wrong with him and, unable to cope on her own, she hires a girl, Mary Clifford, to help her look after him. Mary is shocked by Micheál’s condition, but does her best for him with the limited knowledge she has, aware that Nóra is starting to view the child with fear and revulsion. In this isolated community, neither the village priest nor the doctor are able to offer any useful advice or explanations, so Nóra seeks the help of the healer and wise woman Nance Roche. Nance knows all about the world of the fairies, or the Good People, as she calls them, and tells Nóra that Micheál is not her grandson at all, but a changeling. Together, Nóra, Nance and Mary set about trying to drive the fairy out of the child’s body in the hope that the real Micheál will be restored. As you can imagine, The Good People is not exactly the happiest or most uplifting of books – but then, not everything that happens in life is happy or uplifting either, and, like Burial Rites, this novel is based on a true event from history. Poor Micheál’s story is a tragic one, all the more so because of the treatment he receives from the very people he should be able to rely on for love and affection. The worst of it is, these people really seem to believe in fairies and convince themselves that Micheál really is a changeling, because then there is a chance that he can be cured. Through a mixture of ignorance and superstition, they think they are doing the right thing. Hannah Kent writes beautifully and from the very first page the reader is pulled into a bygone world, a remote community in which the people, despite living in a Christian society, are still holding on to their ancient beliefs and traditions. This is not a fantasy novel or a fairy tale, yet the unseen fairies are a very strong presence throughout the story: we are told that the Good People live in their ringfort, Piper’s Grave, in a lonely part of the valley where lights dance around the ghostly whitethorn tree, and that their powers are strongest at the place where three rivers meet. Everyone seems to know of at least one person who has been ‘swept’ away by the fairies and they just accept these things as part of their everyday lives. Because of the overwhelming sadness of the story and the suffering of little Micheál, I know this isn’t a book that will appeal to everyone, but I was very impressed by it. I loved it for the quality of the writing, the intensity of the atmosphere and the insights into life in a less enlightened time and place. This is the sort of book that appeals to me! Thanks for your review. I have not tried either of Hannah Kent’s books but I will now try this one. It is a distressing story at times, but it’s so beautifully written and atmospheric that I loved it anyway. I’m really looking forward to this one. Nice review! Thanks! I’ll be interested to hear what you think of it. Yes, I remember that you were disappointed with this one. Hopefully her next book will be more to your taste! Sounds like a remarcable story. I haven’t read this author yet, but she looks like one who seeks uneasy parts of history, the everyday lives of normal people and present them to us in a vivid, living way. I loved this book too. It is distressing, but what impressed me was how well Hannah Kent was able to convey the fact that people really did believe that Micheál was a changeling. The existence of fairies was terrifyingly real to the people of the valley. I’m looking forward to reading Burial Rites soon. Yes, that was what impressed me too. They really believed he was a changeling and didn’t realise how cruel they were being. I hope you enjoy Burial Rites! This intrigues me, because in a way Burial Rites is also about the power of belief (and another kind of injustice); like you, I liked her debut but I reread Alias Grace around the same time and Atwood’s is just so good that it was an unfair comparison against a solid debut. I enjoyed reading your thoughts on this one, although I’m unlikely to dash in its direction anytime soon. I read Alias Grace a few months after Burial Rites and thought it was a much better book – it’s hard not to make comparisons as they are similar in so many ways, but as you say, it’s not really fair because Alias Grace is so good! I completely agree with you about Kent’s first book – I really liked it, but I wasn’t quite as enthusiastic about it as everyone else seemed to be. She definitely has a gift for description, though. I remember that she did an amazing job creating the atmosphere of 19th century Iceland. Based on your review I’m tempted to give this new book a try. Hannah Kent has a real talent for creating atmosphere. As you say, her portrayal of 19th century Iceland in Burial Rites was wonderful, and the sense of time and place is very strong in this book too. I have for a while been intrigued by Hannah Kent, seeing her name about on so many blogs. I am pleased to hear you enjoyed this more than Burial Rights. But from reading your thoughts I don’t think this would be for me, as I don’t think I could cope with the overwhelming sadness and the suffering of the little boy. It’s definitely not a book for everyone, but I did enjoy it. Maybe her next book will be a bit more cheerful!